I had a very happy childhood. We lived in a three-bedroom house on a Nottinghamshire council estate. My parents moved there when I was a baby, and Mum still lives there. My parents never had much money. When I was growing up, Dad was a stoker on the railways, working on the steam trains; the pay was poor. We always had good food though. Mum wasn’t a cordon bleu cook, but she was inventive and could make things go a long way. We had a cooked dinner every evening. I remember the food being plain, but fresh and wholesome. We had three meals a day, no snacks, no fizzy drinks, except a weekly treat when the ‘pop man’ came round in his van – my favourite was (and still is) dandelion and burdock – and we only had sweets on Sundays. Growing up, I was a proper tomboy. I didn’t play with dolls and I had no interest in dressing up. I wanted to be outside exploring – just like they did in the late seventies TV play, ‘Those Blue Remembered Hills’. Our council house was one on a new, small estate that has since mushroomed to huge proportions, but when I was growing up, we were surrounded by allotments, fields and woods. Sadly those natural surroundings have all but disappeared from the landscape. The fields around my childhood home hold wonderful memories for me. I would run into the middle of a field full of ripe, golden wheat and lie down in it, with the sun on my face, and bask in the smell of the wheat surrounding me. My sister and I would build dens in the fields and in the old disused allotments. We would come home dirty, our cheeks flushed, feeling happy. We’d have a quick wash before dinner then jump into the bath before going to bed, where we’d sleep like logs. Looking back, it was an almost idyllic childhood – one where we were free to play for hours on end – no parents in sight, monitoring our every move. It was this kind of freedom that allowed us to truly explore and ‘get down and dirty’. I remember playing on my pogo stick in the street and picking up bits of chewed chewing gum off the pavement and putting them in my mouth. Not something I would have got away with under parental supervision, but it was a kind of rite of passage of a free and easy childhood – and more importantly, I think doing such things strengthened my immune system. My sister and I would invariably come home with scraped knees and elbows, covered in soil and mud and other unmentionables. We didn’t think anything of it and Mum certainly didn’t seem to mind. She plonked us both in the bath and the dirt got washed off. No fuss required. I didn’t realise at the time though how important it was to run free and be at one with nature – and the positive impact it would have on my health, both at that time and for years to come. Fast forward to recent years and we find ourselves faced with a growing epidemic of digestive and bowel disorders, with almost 50% of the population struggling with some kind of digestion or gut problem. Babies and children are not immune to this epidemic, with increases in childhood eczema and even children being diagnosed with IBS. What’s going wrong?! 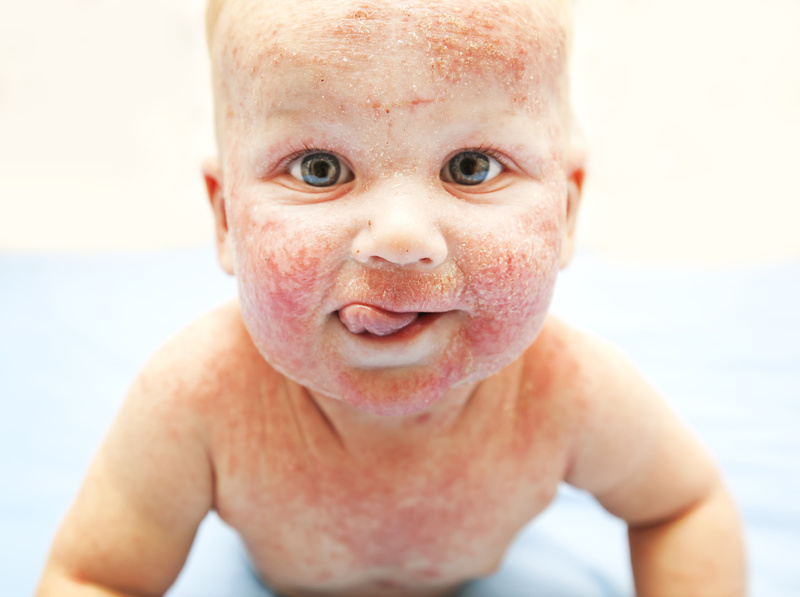 Poor little baby – terrible eczema. It must itch like mad! Things have become too clean and too sanitised. It’s very important that we expose our children to a wide variety of micro-organisms, and that includes the bacteria found in soil and mud. After all, as humans, we have evolved with the soil. We have toiled and tilled the earth for thousands of years. It grows our food and we build our homes on it. We spend lots of our recreation time on soil and many of us get buried in it when we die. Children need to play outdoors and be allowed to play freely, whether they are in the garden or at the park. Encourage your children to dig the soil, plant flowers and vegetables, and get dirty. It will do them good. They will inhale some of the organisms in the soil and these will colonise in their tummies, improving their digestive and gut health, as well as their overall health and wellbeing. And they’ll be blissfully happy. Don’t freak out if they swallow a bit of mud or pick up a stick and put it in their mouth. The worst that can happen is they get a case of worms – and that’s not going to harm your child. Just go to the chemist and get some Ovex. It will soon clear up. If you raise your child in an environment where there are very few germs (bacteria), if you spend hours sanitising your house to within an inch of its life, using lots of powerful bleaches and other chemicals to cleanse every surface in sight, spraying every room with chemical air fresheners and blitzing your kitchen appliances with more strong chemicals, you are doing your child and yourself no good at all. After all, you could be spending that time enjoying the great outdoors – so get out and get dirty. Your lives and immune systems will be richer for it.